Our final inaugural lecture for this academic year will take place in the EBC on Monday 30 April and will be given by Professor Jane Murphy from the Faculty of Health & Social Sciences. Good nutrition helps us to stay healthy and is a fundamental part of living a long, full and rewarding life. Food security, lifestyle and personal choices are some of the key factors that influence our ability to eat well and meet our nutritional needs. To help us navigate through these issues, we need the advice of qualified, experience and skilled nutrition professionals. But with some many conflicting messages about nutrition and health, how do we know what’s best and who to believe? Who should we trust to provide scientifically sound and effective nutritional advice? 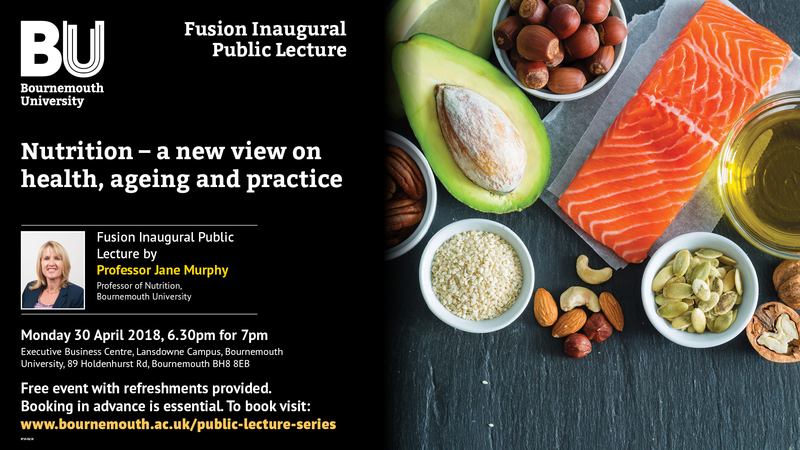 Through her inaugural lecture, Professor Murphy will discuss the nutrition landscape in the UK and draw on her research journey to show recommendations around diet changes, particularly those linked to age-related conditions, have been underpinned by scientific evidence. Her lecture will discuss the challenges faced by nutritional professionals when translating knowledge into practice and the solutions she has used when developing new approaches to education and training in the wider health and social care workforce. Jane Murphy is Professor of Nutrition, a Registered Nutritionist and Dietitian and co-leads the Ageing and Dementia Research Centre at Bournemouth University. Her research is committed to key nutritional problems faced by older people, especially the complex problems faced by people living with dementia and those living with and beyond cancer. At a national level, her ongoing work with Health Education England has provided evidence informed, high quality education and training to improve practice in dementia care across the health and social care workforce. Professor Murphy is committed to advancing the professional practice of nutritionists and is an elected Council member and Trustee for the UK Association for Nutrition and sits on a number of other national advisory boards including the Malnutrition Task Force with Age UK.